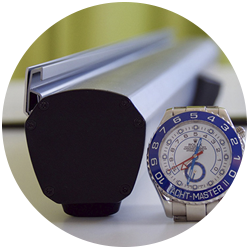 The LIGHTEST, SMALLEST, MOST VERSATILE retractable banner in the world! Quick set up and bold displays are why Roll-It-Ups should be the cornerstone of your display marketing. Our Fabric Walls go from folded to fabulous in 10 seconds flat. The graphic fabric panel comes attached to the frame. Fly your colours inside or out with Corporate Graphics’ Outdoor Flags. These all-weather displays always grab attention – especially in a good breeze. The ability to fold and carry make this economical display unit a great choice for the exhibitor who is seeking flexibility to meet changing needs. The velcro receptive fabric allows you to design, print and place your own posters and photos. It’s an open and shut case. QuikFrame’s c-spring clips snap open on all four sides for swift and effortless graphic changes. It’s a simple concept that works. And works and works. It lets you hang any graphic, virtually anywhere.